The Nick Kotys Award has been presented to the top High School football player in Miami-Dade County and is the most prestigious individual award given to a football player at the High School level. Many past winners have gone on to excel at the collegiate and professional levels; with Kotys award winners being Heisman finalists and NFL stars. The award is given in honor of former Coral Gables Senior High School football coach Nick Kotys who coached at Gables from 1953-1971. During his tenure, he led the Cavaliers to 6 state championships and 4 national championships. 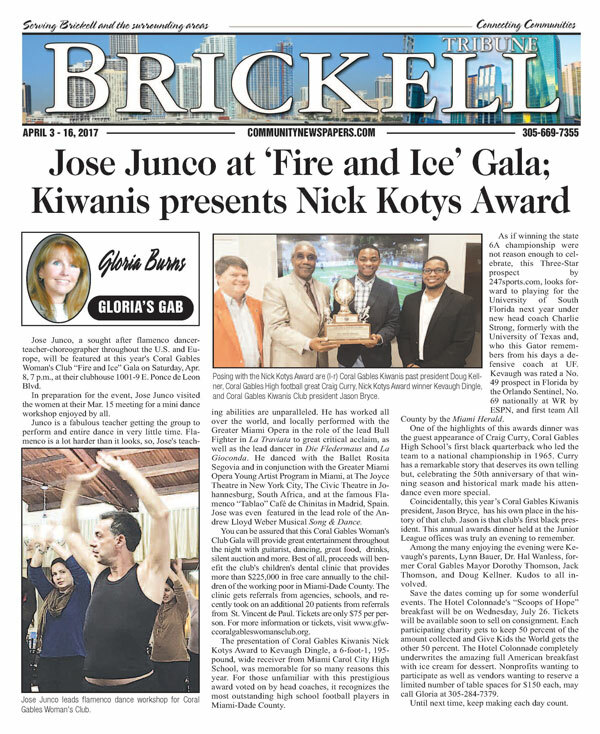 The Kiwanis Club of Coral Gables has presented the Nick Kotys Award since it’s inception in 1988. In the early years of the award Coach Kotys would be on hand at the presentation to congratulate the winner in person. Sadly, Coach Kotys passed away in 2005 at the age of 92. His legacy of dedication and excellence lives on with the Nick Kotys Award. The Nick Kotys Award is voted on by all 30 Miami-Dade County High School football coaches and one vote from the Miami Herald. The recipient receives a beautiful gold engraved trophy during the ceremony and his name is added to a glass plaque during the annual Awards dinner hosted by the Kiwanis Club of Coral Gables. In 1998 the Kiwanis Club of Coral Gables adopted the migrant children of southwest Miami-Dade Country as our Christmas patrons. 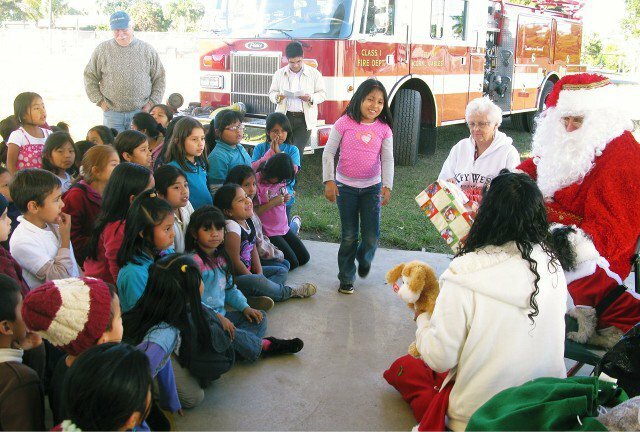 We have been donating toys to this underserved population for years and hope to continue this wonderful tradition for many years to come! Each year, in conjunction with the Homestead Kiwanis Club we provide a Christmas party to end all parties. Watching the joy in their little faces is a treat for us all and a special privilege for Kiwanians. The future leaders of America to be sure. Back in 1954 The Kiwanis Club of Coral Gables became the charter sponsor organization for the Troop 7 Boy Scouts, and continues that relationship to this day. The Club provides manpower and financial support to the historic scout house nestled along the Granada Golf Course. The original cabin was a gift from city founder George Merrick to the Troop. The current structure is home to the Troop 7 Boy Scouts and Pack 7 of the Cub Scouts. The Coral Gables Scholarship fund was started by Don Hicks. Kiwanis of Coral Gables presents scholarships to the select students who show outstanding community service. A.C.E Academy is a school specializing in the education of students who are unable to maintain the necessary grade point average to attend regular high school. 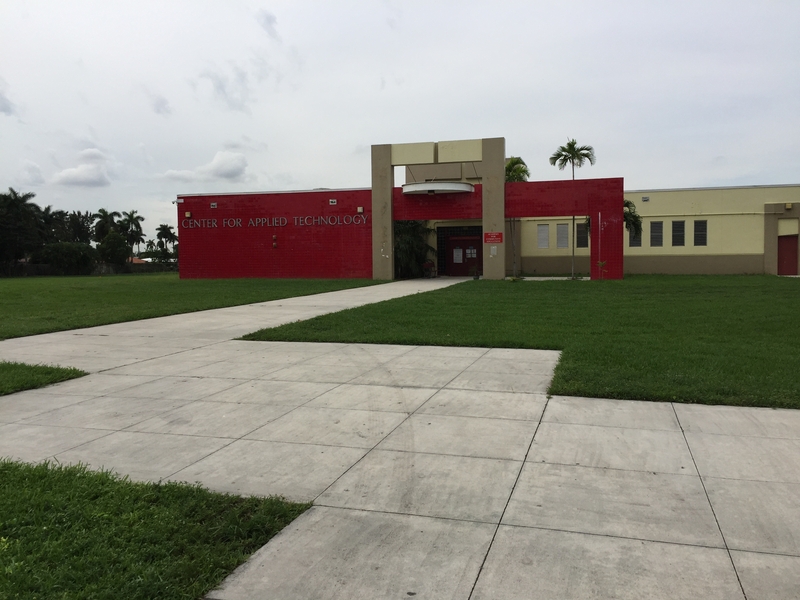 Kiwanis of Coral Gables has partnered with the staff at A.C.E to help provide any resources that the school may be lacking. Many of the students come from lower income and single parent homes. The staff at A.C.E strive to help all the kids that come through their doors graduate, and Kiwanis of Coral Gables is committed to help them accomplish this any way we can.